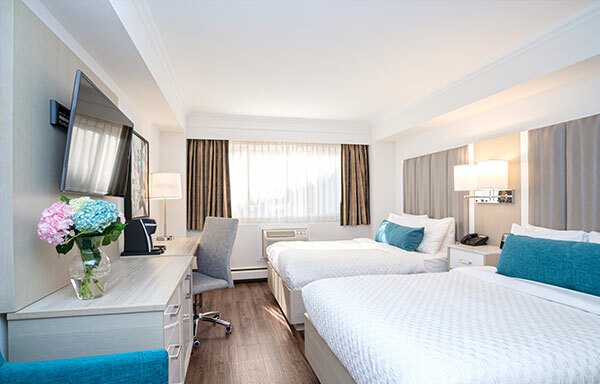 The Best Western Dorchester Hotel in beautiful Nanaimo offers 70 spacious, non-smoking rooms and suites to fit every need and budget. 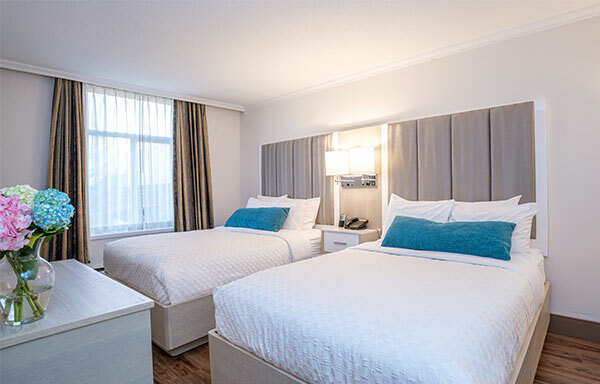 With an ideal downtown harbour front location, perfect for both business and leisure travel, we guarantee a good night’s sleep, along with top-notch hotel amenities and services , for a fun, productive stay in Nanaimo. 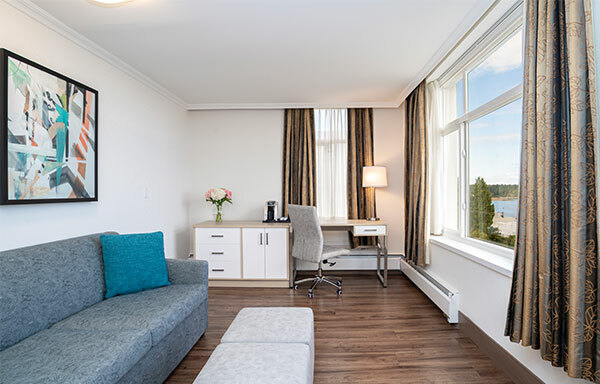 Look no further for comfortable, convenient Nanaimo accommodations and book your room or suite online today for our best available rates. 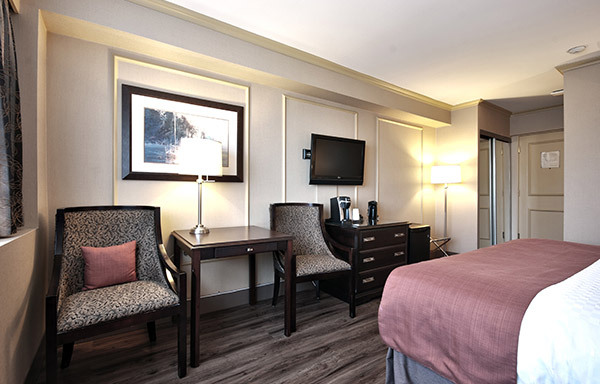 Group and corporate rates are also available - call us today to inquire! 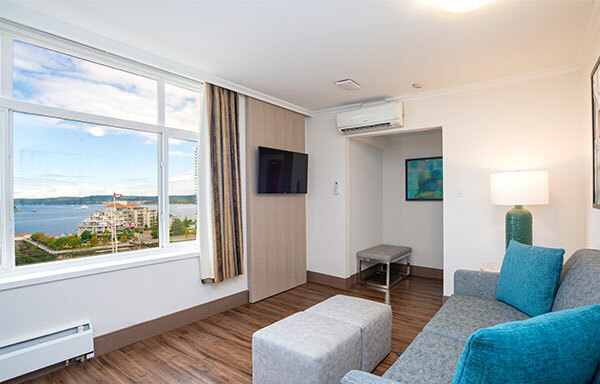 Featuring tasteful decor and your choice of one Queen or two Double beds, our Standard Room is perfect for single travellers, couples, or families. 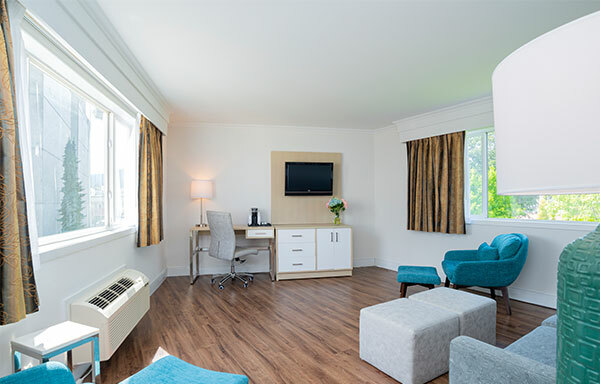 In-room amenities include a 32” flat screen LCD TV, free high speed Wi-Fi, a Keurig K Cup coffee machine with complimentary coffee, a refrigerator, work/desk space and more. 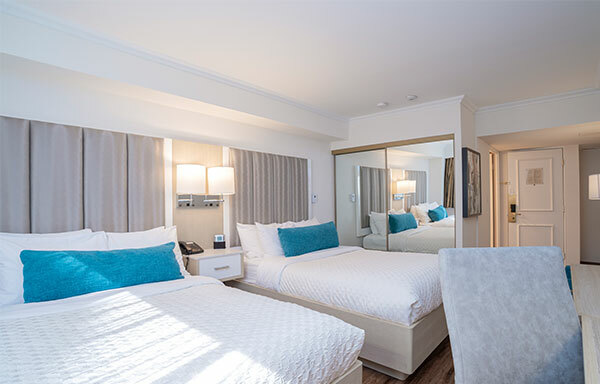 Ideal for families, this Family Hotel Suite offers two comfortable Double beds in the bedroom, a separate spacious living area, two flat screen LCD TVs, and many more convenient in-suite amenities, including free high speed Wi-Fi, a Keurig K Cup coffee machine with complimentary coffee, a refrigerator, work/desk space and more. The Junior Suite is designed for business travellers or leisure travellers looking for more room to breathe. 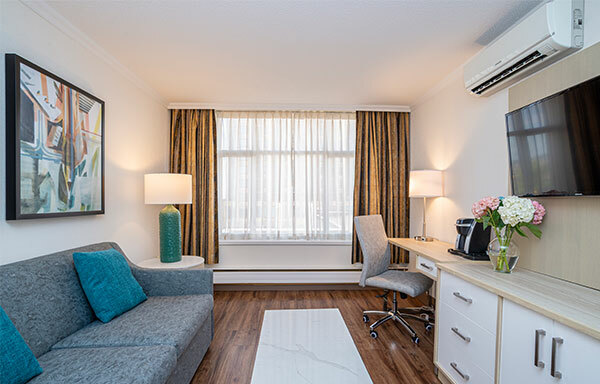 With a comfortable Queen bed nestled away in a cosy nook just off the main living space, you can enjoy a host of in-suite amenities including a 32” flat screen LCD TV, free high speed Wi-Fi, a Keurig K Cup coffee machine with complimentary coffee, a refrigerator, work/desk space and more. 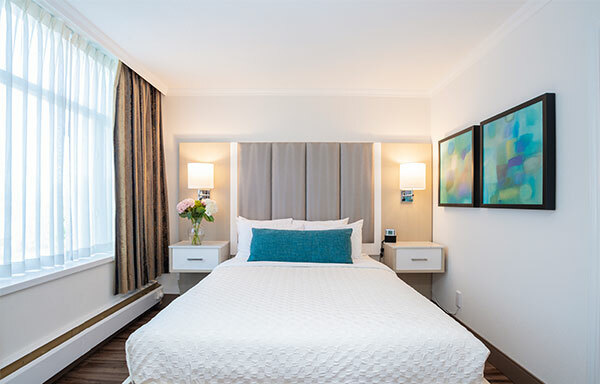 Stretch out in your comfortable King bed in this attractive suite, featuring your choice of city or harbour views, a 32” flat screen LCD TV, free high speed Wi-Fi, a Keurig K Cup coffee machine with complimentary coffee, a refrigerator, an activity table and more. This suite is ideal for single travellers or couples. 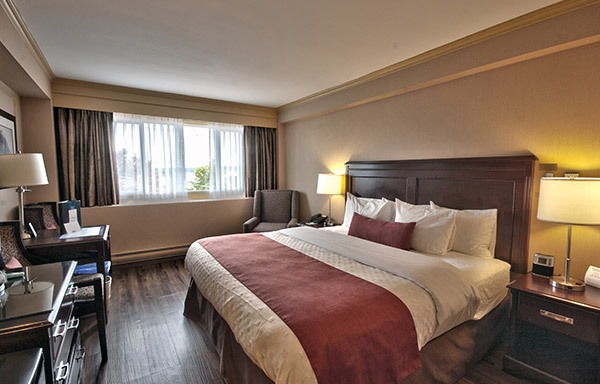 Wake up to stunning views of Nanaimo Harbour in this spacious suite. 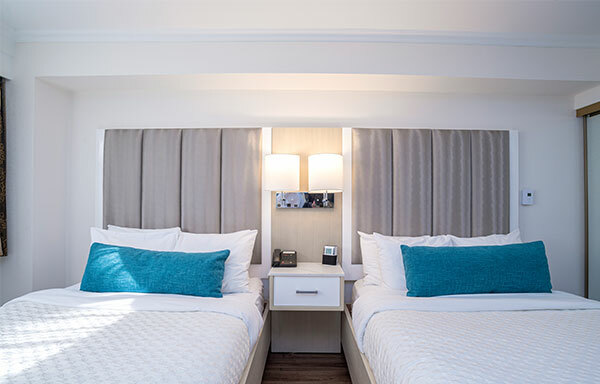 The Premium View Suite features one Queen bed in one section and a sofa bed in the living room with panoramic Harbour View, a 32” flat screen LCD TV, free high speed Wi-Fi, a Keurig K Cup coffee machine with complimentary coffee, a refrigerator, an activity table and more. 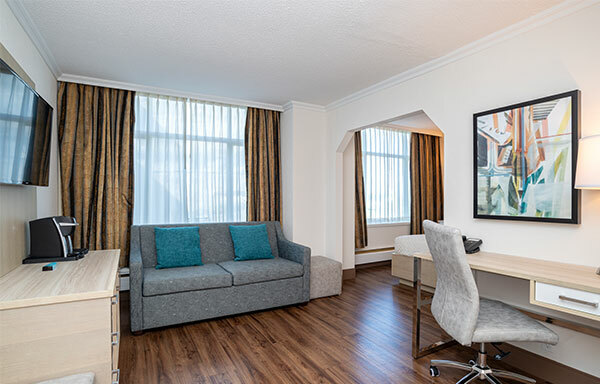 This Executive Suite is the perfect place to relax and work, with a separate bedroom featuring a luxurious King bed and a spacious living area perfect for work and in-suite meetings. 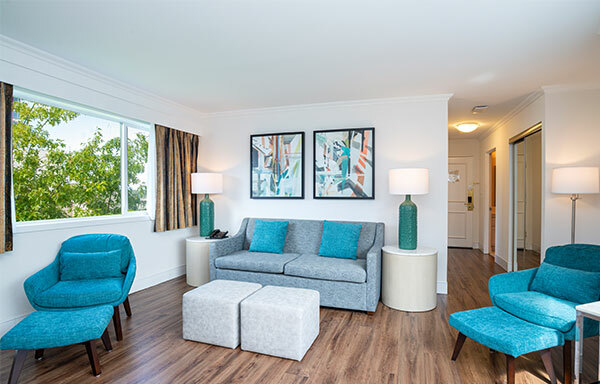 This suite also features in-suite amenities including two LCD TVs, free high speed Wi-Fi, data ports, a Keurig K Cup coffee machine with complimentary coffee, a refrigerator, work/desk space and more. 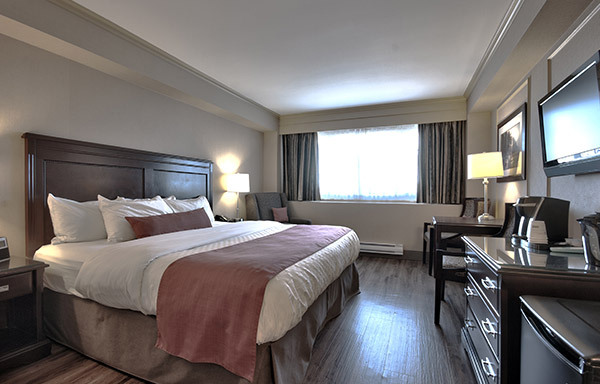 If you need accommodations for a large group, we would be happy to arrange a special group rate for you. Please call us at 250-739-5050 or send us an email to make you group travel arrangements today.